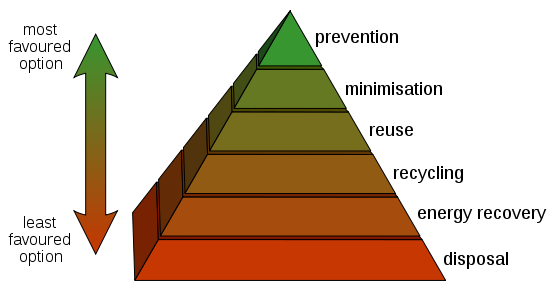 The waste hierarchy ranks waste management options according to what is best for the environment. It gives top priority to preventing waste in the first place. If waste is not produced then it has not to be disposed of. When waste is produced, it gives precedence to preparing it for reuse, then recycling, then recovery, and last of all disposal. Prevention: The prevention of waste is the most vital point in the waste hierarchy. Prevention or reduction minimizes the generation of waste products in the first place. Prevention usually results in the least environmental and economic life cycle costs because it requires no collecting or processing of materials. Prevention also typically produces significant benefits in terms of production efficiencies and the use of resources. It involves using less material in design and manufacture, trying to keep products for longer, and using less hazardous materials. Reuse: The reuse of waste is the next most desirable option. It is any operation where products or materials that are not waste are used again for the same purpose for which they were intended. Reusing waste often requires collection but relatively little or no processing. It involves checking, cleaning, repairing, and/or refurbishing, entire items or spare parts. Recycle: Recycling of waste is the next step in priority. It is any activity that includes the collection of used, reused, or unused items that would otherwise be considered waste. Recycling involves sorting and processing the recyclable products into raw material and then remanufacturing the recycled raw materials into new products. Recovery: The recovery of waste is further separated into categories: the recovery of materials and the recovery of energy. Whichever of these two choices is better for the environment and human health is the preferred option. The recovery of materials is most often preferred and includes activities such as recycling and composting. These management activities generally require a collection system and a method of material processing and conversion into a new product. Recovery of energy, such as incineration, is usually the less preferred option. The conversion of non-recyclable waste materials into usable heat, electricity, or fuel is done through a variety of processes, including anaerobic digestion, gasification, and pyrolysis. Disposal: The last resort is disposal and is only considered once all other possibilities have been explored. Disposal is any operation that involves the dumping and incineration of waste without energy recovery. Before final disposal, a considerable amount of pre-treatment may be necessary to change the characteristics of the waste in order to reduce the quantity or harmfulness of the waste and that may include physical, thermal, chemical, or biological processes. Landfills are the most common form of waste disposal and the final disposal option.